WHO will develop a 5-year global strategic implementation plan, support member states in making national 5-year action plans, support and further strengthen the work of the National IHR Focal Points and link the building of core capacities under the IHR with health systems strengthening. WHO will increase the number of personell dedicated to the IHR and preparedness capacity building through the new Health Emergency Programme, and enhance WHO’s coordination and collaboration with other entities and agencies both within and outside the United Nations, especially the Global Outbreak Alert and Response Network (GOARN). Member States should use the revised IHR monitoring and evaluation framework with the four components: annual reporting, joint external evaluation, after-action review and/or simulation exercises. The external evaluation should be done at least once every four years. WHO will use a new set of procedures to counduct rapid risk assessments in response to newly detected public health events in order to determine whether an event constitutes a low, medium, high or very high risk of amplification and international spread, and publish these results. A new scientific advisory group of experts for infectious hazards will guide WHO’s work. WHO will identify, collate and monitor additional measures taken by Member States that go beyond the temporary recommendations issued by the Director-General in terms of travel and trade. WHO will publicly report on these additional measures through the WHO website and follow-up with countries, and consider the procedures for escalating cases of non-compliance. WHO will share line-listed data for epidemiologic studies and mathematical modelling in response to emergencies, and ensure rapid access to new information and data from public health studies and clinical trials to allow the timely application of these in the response. Work will continue to enhance the sharing of genetic sequence data for pathogens. 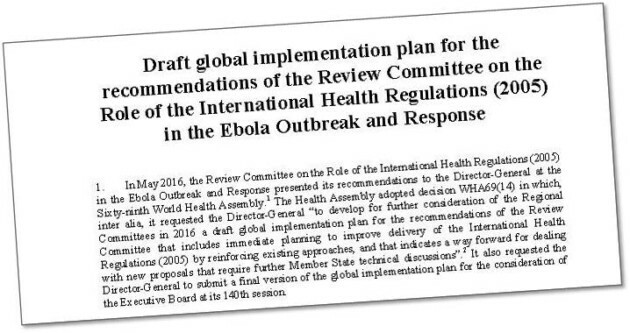 The draft plan is a follow-up of the Review Committee on the Role of the IHR in the Ebola Outbreak and Response, commissioned by the 2015 World Health Assembly (WHA), the supreme governing body of WHO. This committee presented its report and recommendations to the May 2016 World Health Assembly. The WHA requested the Director-General of WHO to draft a global implementation plan for the recommendations and present to the organization’s six Regional Committees in the autumn of 2016 and then to the Executive Board in January 2017. The plan may then be finally approved at the WHA in May 2017.